My favorite form of baked goods is the cupcake. Eating a cupcake is like enjoying a treat that was specifically baked for you and only you. I enjoy baked goods so much so that I even enjoy baking baked goods. Every once in a while I frenzy bake. What I mean by this is that I will bake continuously for about a month and then I will just stop. It’s almost as if I have to get baking out of my system to function. Part of this stems from the fact that baking soothes me in a way that nothing else can. It allows me to completely focus on a single task. To be a good baker, you have to understand that it takes precision. Once you get the basics down, then experimentation can take place to create custom recipes. I am still in the stages of getting the basics down, but I hope to one day soon get to the stage where I can create my own baking recipes. 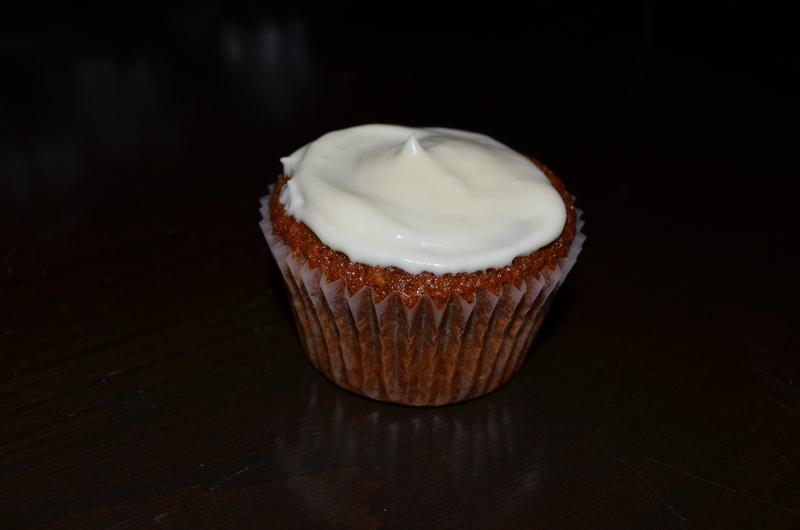 With being said, my first baked good in this frenzied period was Carrot Cake Cup Cakes with a Cream Cheese Frosting. Carrot cake is one type of cake where you never know what you’re going to get. Typically carrot cake can be baked with a plethora of ingredients in addition to the traditional carrots and nuts. Some of these extra ingredients include raisins, pineapples, dates, and coconut. Carrot cakes with all these ingredients tend to be too much for me. I like my carrot cake unadulterated with only carrots and nuts. That’s why when I came across a Food & Wine recipe for Carrot Sheet Cake with Cream Cheese Frosting, I was intrigued. The best thing about this recipe: it only contained carrot and walnuts. None of that extra stuff that, in my opinion, ruins carrot cake. Do you enjoy baking? If so, have you found any recipes that you really enjoy? If so, share them in the comment section. These strawberry cupcakes are sooooo good. Looks so good, I really want to try it! They were really yummy. My mom liked them so much that she asked me to make her a pound cake version, which I did a few days later.